At the outset of the season, the Triple-A Durham Bulls possessed one of the most prospect-laden rosters in the International League. They may have lost one of their best for the rest of the year a little more than two weeks into that campaign. Rays No. 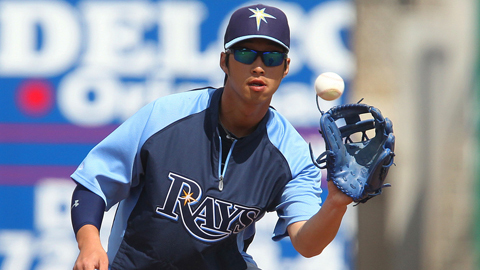 5 prospect Hak-Ju Lee left the opener of Saturday's doubleheader with Norfolk with torn knee ligaments and could miss the rest of the season due. The 22-year-old shortstop was injured in the fourth inning when second baseman Tim Beckham attempted to start a double play with a backhanded flip to the bag at second. With his momentum carrying him toward the right side of the infield, Lee tried to make the catch but had his knee collide with the head of Tides baserunner Travis Ishikawa. Lee immediately hit the ground and began to roll around in obvious pain, clutching his left knee before Bulls trainers could get to him. He exited with the help of a trainer and teammate while dragging his left leg. Ishikawa also did not return and sat out the nightcap. "The guy's got a broken nose, so he went face-first into his knee by all accounts," Rays top prospect Wil Myers told the The (Durham) Herald-Sun. "With where the ball carried, we probably should have taken the out at first with a five-run lead. "[Beckham] tried to make an aggressive play and get the force. It's just bad luck." MLB.com reported that Lee likely is done for the rest of the season, although the exact extent of the injury was not known. "Right now, we know he's got a couple of torn ligaments, and he's going to Tampa to be further evaluated," hitting coach Dave Myers told the Herald-Sun. Considered one of baseball's best shortstop prospects because of his advanced glove, Lee was off to a hot start with his bat, hitting .422/.536/.600 through 15 games with the Bulls. That was well above the South Korea native's .290/.364/.388 averages through four-plus seasons since signing with the organization in March 2008.